I really should have thought of that. On some urban legand site, there was a story about a 'rabbit man' or something. I read the rabbit man story and it sounds like a prank to me. But I have to admit, it did give me the chills. And I'm not too worried about rods; just El Chupacabra. And ball lightning, which I think has been confirmed. picture of chubacabra, highly doubtful, does not fit regular description. i'm more used to something like this. and a flame with a face, reminds me of john kerry. That first picture looks like that one Jedi from Clone Wars Episode 20, he was cute. Oh that reminds me, did anyone see the SW Tales comic where Han and Chewie do something weird (wrong hyperspace coordinants? Black hole? I forget) and wind on crash landing on earth. Chewie becomes Big Foot. Yeah, the rabbit man story was fairly creepy. The first picture reminds me of Wiphids. 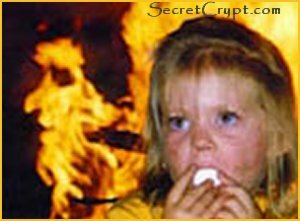 In the last two pictures, there is a dark red face behind the one in the flame. Yeah, The red face looks far more sinister than the jolly-looking one in the flame. Chupacabras aren't too frightening I don't think. Maybe creepy. Actually, I saw the face in the bottom right corner of the fire first before I saw the other two. I am not sure which face you are talking about, but I have found two more (one of which may be the one that you have found. First, look right above that gray thing. 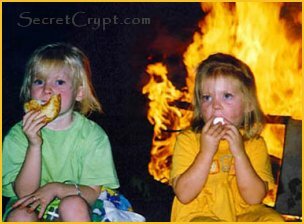 Next, look between the two girls, a bit lower than the fire. I don't care either way about the pic, I just found it fun to find the faces. Me too, I have found four so far (six if you count the girls ). I just saw Chariots of the Gods. I know it's an older movie, but my mom and I were at the pawn shop the other day and my mom saw it and went, "I saw that when I was younger, let's buy it I know you'll love it". The sound quality and image quality weren't so good, the entire movie was slightly staticy and there were several white splotches here and there on the image. I liked how the entire movie was like one big question. I liked it, overall. Very interesting and cool. If you're into the Illuminati and stuff read Dan Brown.His books are really good.My dad was offered to join the Freemasons but he didn't do it-I heard the only way you could become was that you had to be related to one or asked to join.Aren't the women called the Stars of the Masons or something? Bigfoot is real I've seen him.I was hunting with my grandad and we saw him.Scared the crap out of me,not sure on Nesse...how can a 10 gazillion year old dinosaur be living in Scotland?It's cold there! That picture is weird...three faces so far. Nessie supposedly came from the sea, though.